Faculty of Engineering – Cairo University is taking the lead in the region and introduced a special MSc program entitled “Integrated Engineering Design Management” (IEDM) (http://www.bimide3.com/iedm/) to promote ‘Digital Building’ concept in Egyptian Construction Industry. Training CUFE students to master ‘Digital Building’ is deemed important in the current market place where many countries and codes require the implementation of BIM in the executed construction projects. Further, Egyptian graduates would compete with the modelers from other countries who perform BIM modeling for the Mega construction projects worldwide. 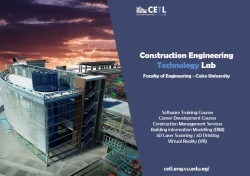 This initiative is named Construction Engineering Technology Lab- Student Training Initiative (CETL-STI). It aims at training CUFE third year Civil/Construction students.